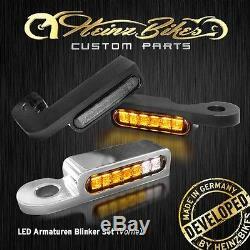 Heinzbikes led couplings combination flashing-position light softail -14. This product page has been automatically translated. If you have any questions, do not hesitate to contact us. 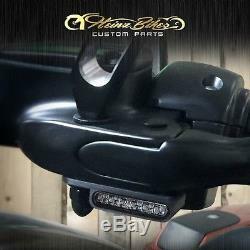 Winker led light set (r-l) for softail models until 2014 in black, with position light. 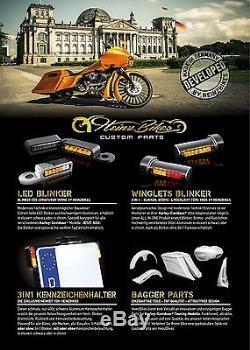 Winker led light set (r-l) for harley-davidson softail models until 2014. 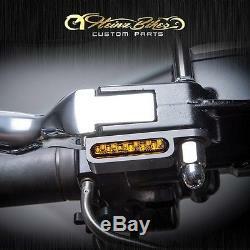 Indicator of ultra-bright led fittings in high quality aluminum that fits perfectly to any design of the bike. The indicators are attached directly to the respective mirrors with the original nut. Available as an option with integrated white position lamp. One piece milled CNC milled aluminum · for permanent quality black or chrome anodized the latest technology in smaller construction · · mount directly to the respective mirrors with the original nut (plug & play) · directly connected to a boardnetz 12v can not, so no additional resistors are required · 100% designed fit, as the indicators specifically by model number and year of manufacture and are manufactured precision work · -quality of Germany. LED lighting devices are an e-mark and are approved. You can be mounted without further ado, installation instructions. This is an original product from Heinzbikes. On the internet there are many manufacturers of lights. Unfortunately, cheap and poor quality copies of our products are offered. In the market that specially designed and manufactured for one by model number and year of manufacture. After buying a fit between the model and the year specify so that we can send you the appropriate indicators. From now on available in our shop for the following models. Touring models with hydraulic clutch. Dyna 1996 models & dyna low rider s models. S models with hydraulic clutch from 2014. Made in germany - developed by hamed bikes you perfect the look of your bike with custom components from the business of heinzbikes. Originally specialized in harleydavidson®, we manufacture parts for all brands of motorcycle now. In the wallet of heinzbikes fittings are flashing, led turn signals for rear, all-in-one plate holder, among other things, led etc ..
All parts are high quality aluminum cnc machined and black anodized in connection or chrome plated. To ensure 100% accuracy and for such indicators as always to rinse with fittings, they are meant by model number and year of manufacture specially designed and manufactured. LED units have a brilliant homogeneous brightness & provide the best quality of safety in road traffic. All lighting units equipped with-mark. 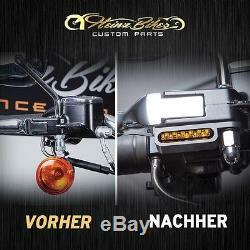 Innovative & attractive custom parts that are not always any updated bike. Heinzbikes products are high quality precision work from Germany. _gsrx_vers_795 gs 7.0.7 (795). 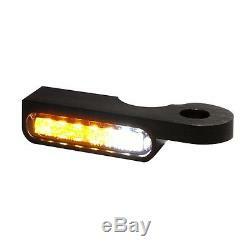 The item "heinzbikes led couplings combination flashing-position light softail -14" is on sale since Thursday, February 22, 2018. 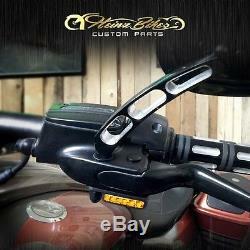 It is in the category "auto, motorcycle parts, accessories \ motorcycle \ spare parts \ headlights, turn signals \ indicators ". The seller is "heinzbikes" and is located in schönfließ. This item can be delivered anywhere in the world.